So you’ve got the best chef around, amazing servers, delicious cocktails, and TVs playing the biggest game of the year. But if you don’t have any customers inside, it’s all for nothing. And that could be a reality if you don’t up your curb appeal and draw people in from the outside. 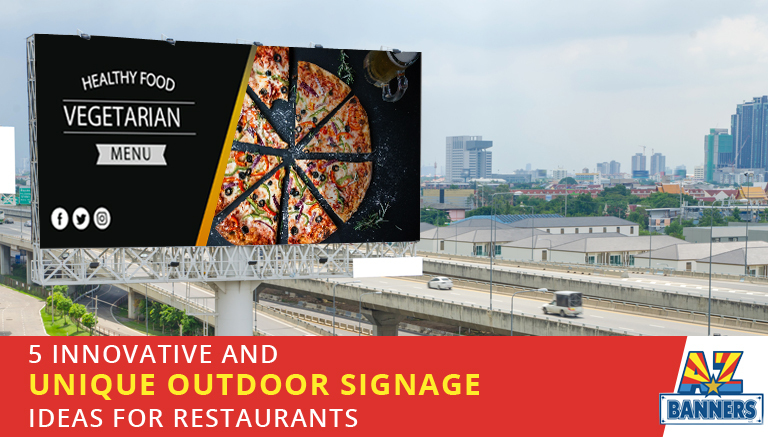 Interesting, eye-catching, unique outdoor signage is one surefire way to grab people’s attention and lure them inside your restaurant. But cheap looking wooden signs you’d see used at a yard sale aren’t going to cut it. You need innovative and unique signs to really make an impact. Keep reading for 5 ideas you can use when making your outdoor restaurant sign. Recent graphic design trends have emphasized extreme minimalism, so much so that many designs, logos, and branding ideas seem excessively “clean” and borderline sterile. Make your signage unique by commissioning an artist to bring your branding and the message of your signage to life. Illustration is becoming increasingly popular for signage and branding, so use that to your advantage. This will make your restaurant approachable, fun, and stand out from the “minimal clean lines” crowd. Consumers love when businesses relate to them as though they’re friends. Humor is a great way that many top businesses and brands are able to do this. So get a little silly with your signage. Use food puns or make a joke about happy hour. Check out this list for some ideas. The material the sign is made of can help it stand out from the crowd of restaurants that all look the same. Signs can be made of plastic, wood, foam, metal materials, banners, neon, etc. Have a few different signs made of different materials in order to keep each one unique and interesting. As we mentioned before, minimalism has been dominating business branding and signage in recent years. You can have your signage stand out by upping the brightness and the contrast of the sign. With businesses and restaurants around you all using the same white-taupe-black color palette, how can they not take note of a sign made with bright and contrasting colors? It will catch their eye in a sea of simple signage (say that five times fast). We’ve all seen that restaurant in town that has the same exact sign up every day of the year for years on end. It looks raggedy, old, and out of touch with modern designs. Don’t let that be you. Consistently change your signage either with new specials you’re offering, as new seasons roll in, or even as the months change. Do whatever you can to keep your signage fresh and interesting. That way, even regular customers will see you switching it up and keeping your signs fresh and new. Unique Signage Ideas: Which Will You Use? These 5 ideas for unique signage are more jumping off points than they are specific ideas. Try to think how you can use these ideas to mesh with your restaurant’s image and branding. If you think you have the next best sign idea since flashing neon lights, you can fill out our online form and get a quote. If you need a bit more help with design or logistics, contact us.